Overcrowding is hampering improvements at a south London jail, according to the chief inspector of prisons. Anne Owers said the number of inmates was stopping Brixton Prison reaching its full potential. 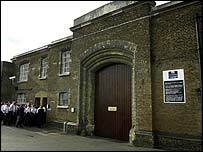 The prison, branded institutionally racist in 2000, was commended for improving prisoner and staff relations and arrangements for new prisoners. But an inspection report said some basic needs, such as pillows, privacy and cleanliness, were not being met. And it found while senior managers and many staff were trying to make improvements, they needed more support to get results. Ms Owers described the prison as "an overcrowded, under resourced local prison with too many prisoners held only for short periods". There were not enough spaces on activity programmes for the 798 prisoners, the inspection found. While inmates were allowed out of cells once a day, timings varied so they could spend 24 hours in cells at a time, although measures have since been taken to address this. Ms Owers also said "response to cell call bells, which could signal an emergency, was unacceptably lax", and "the kitchen was a health and safety risk". But the inspection in February found staff and prisoner relationships were generally relaxed and most prisoners said they were treated with respect. Ms Owers said the prison suffers from a "cramped and elderly site" and to fulfil its potential it needs a smaller and more stable population. She added: "There should be a project team to manage the major change programme now under way to ensure the new developments are firmly bedded in." Prison Service Director General Phil Wheatley welcomed the report's comments about progress in health and race relations made by staff and said he was confident improvements would continue.